Located across the tracks from Wallerawang's coal fired power station is this electrical substation. 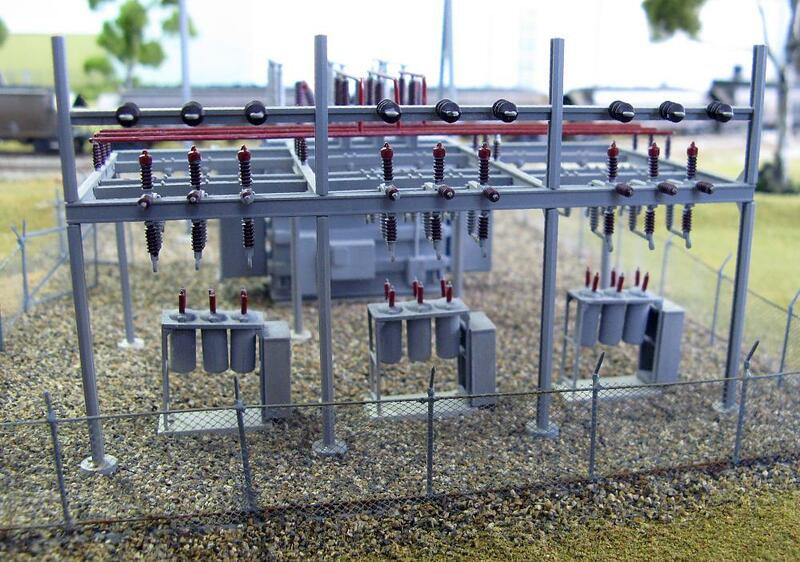 The next structure to appear on the layout is an electrical substation, which is a Walthers Cornerstone kit assembled as per the instructions. The electrical components were painted various colours based on our observations of real electricity yards. The kit includes a plastic base which we used as it has holes for the various components to be glued into. Real yards of this type usually have a gravel base for drainage so after gluing the base down to the timber baseboard, we covered the plastic base in a thin layer of ballast. The edges were tidied up with various scenic materials and a dirt driveway installed using pre-coloured plaster. The excellent chain link fence is included in the kit. 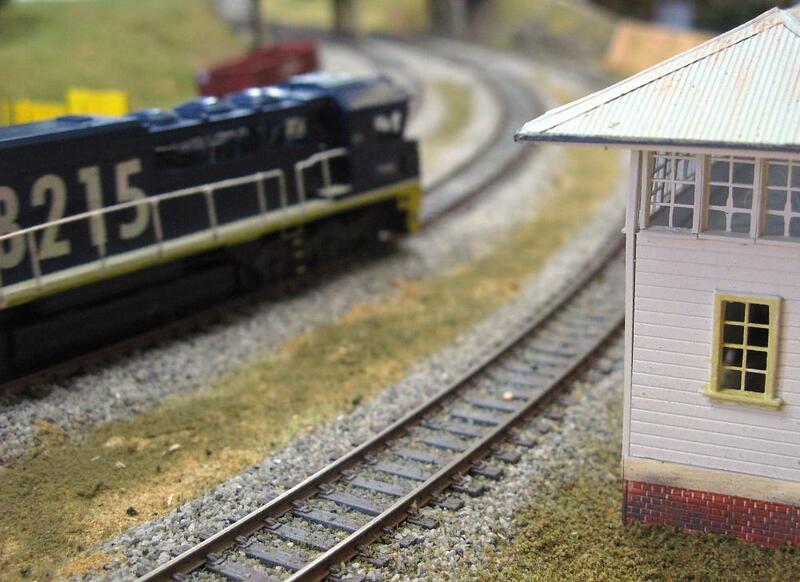 The scratchbuilt Fettler's Shed includes roof drainage and a water tap as per the prototype. 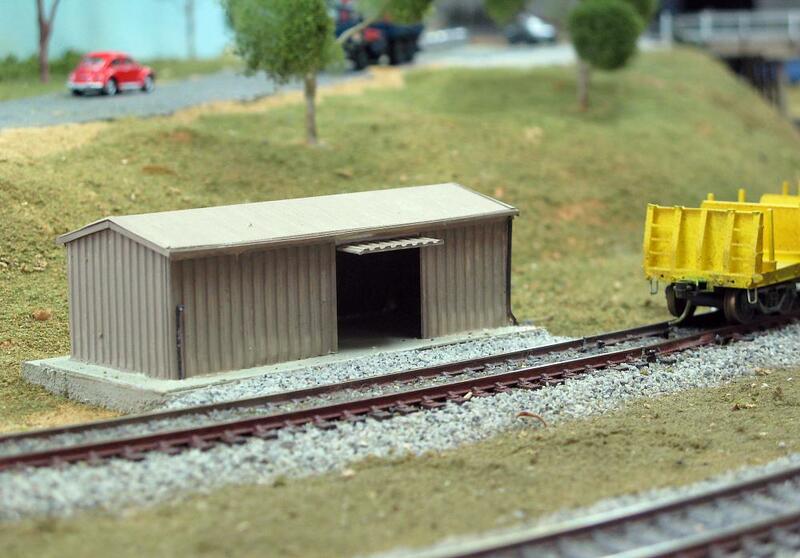 The next item to be scratchbuilt is the Fettler's Shed, located alongside the Loco siding, west of the road bridge. Originally this shed at Wallerawang would have been a traditional style corrugated iron structure with hinged doors fronting the rail siding. At the time of our model of Wallerawang the old shed has been replaced with a more modern Colorbond steel building. Going only from site photographs we constructed this shed from Evergreen styrene ribbed sheet for the walls and pitched roof. This is a neat representation of the ribbed steel sheet that has been used on the prototype. The entry doors are overhead tilt style doors, and we have modelled one in the open position, allowing us scope for interior detailing in the future. The styrene building sits on a piece of balsa, painted to represent the concrete slab base of the prototype. Still to be added is a water tank, and the ubiquitous railway junk that can always be found in and around these sorts of facilities. Another view of Wallerawang West Box which was added to the layout in early March 2010. In the background 8215 crawls past the signal box as it leads a loaded coal train from the Mudgee Branch onto the Up Main.